Where Science and Summer Fun Meet! It’s that time of year again and we’ve been working hard to prepare a science camp experience that will make your science student excited about science. We will explore some new destinations as well as some old favorites. Your student has seen the pictures in the science textbook, now they can experience the science first hand-going to places where science is actually happening. 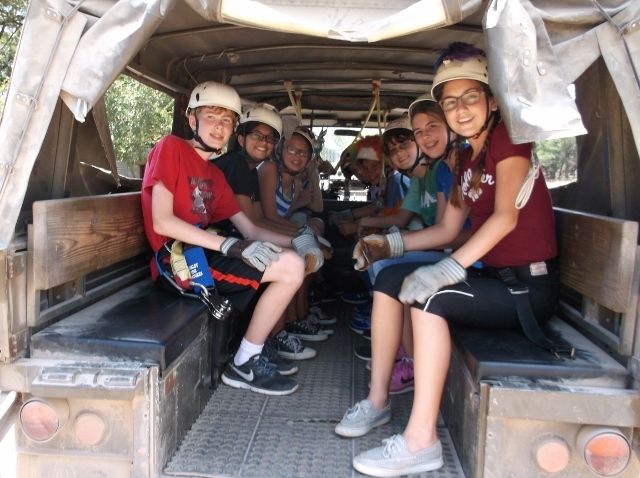 Whether it’s exploring Hill Country ecology by Zip-Line or learning human anatomy in a state of the art medical school laboratory, your student is sure to learn and see many fascinating things—not to mention, having a great time. We believe the middle school/junior high years are a time for exploring and investigation…and having a lot of fun learning along the way. Young people develop their dreams for the future at this age. At Summer Science Safari, we help students envision their futures and what it takes for them to achieve their goals. We pack as much science and learning into five days as we can and top it off with lots of fun. For our high school students, we are taking the concept even further by introducing our students to professions in science, engineering, and applied mathematics at facilities where professionals in their fields actually carry on their work. Although the level of activities is higher than for the middle/junior high level students, the concept is the same...to learn how science actually works in our society and how they can become a part of it. ALL of our Camp Coordinators are Certified GT/HONORS LEVEL Science Teachers at some of the very best middle/junior high and high schools in the greater Houston area. Most all of our teachers are involved in competitive science activities such as Science Olympiad, Olympics of the Mind, Robotics, and the like, so they know what it takes to motivate high performing students. We will have 2 adults assigned for every Session with a maximum of 13 students. For 19 years, Joe Watson, Head Coach of the 2011 State Champion Riverwood (Kingwood) Middle School Science Olympiad Team and Head Coach of the 2013 State Champion Beckendorff (Katy) Junior High Science Olympiad Team, has provided one of the best Summer Camps, around. With degrees in Meteorology and Secondary Education and Certifications in G/T and Earth and Life Sciences, he has had over 21 years’ experience teaching middle school/junior high students. Along with our team of science professionals we have created a science adventure that you don’t want to miss. Mr. Watson will coordinate the Kingwood, Bar Area, and The Woodlands Areas. Again this summer, we are offering 2 Full Sessions of the SUMMER SCIENCE SAFARI in the Clear Lake City/League City/Bay Area based at Space Center Intermediate School in Clear Lake City. The Bay Area sessions will be conducted by the Camp Director, Joe Watson. Kenneth Fletcher will be leading this year’s camp located at Reading Junior High School in Richmond. Ken has been a teacher in public education for the past 18 years. He holds a Master of Science Degree from the University of Houston-Victoria. He spent the first ten years of his career at Briscoe Jr High School in North Fort Bend County, and since moved out to Rosenberg to start and raise his family. He has been teaching in the Lamar Consolidated ISD for the past 18 years. He currently teaches 7th and 8th grade science at Reading Junior High School. This will be his second summer of facilitating the Summer Science Safari in the Fort Bend County area. Again this summer, we are offering 3 Full Sessions of the SUMMER SCIENCE SAFARI in the NEW CANEY/PORTER area based at New Caney Middle School in New Caney and will accompany The Woodlands Sessions. The New Caney/Porter sessions will be conducted by the Camp Director, Joe Watson. Again this summer, we are offering 2 Full Sessions of the SUMMER SCIENCE SAFARI in the SUGARLAND area based at Dulles Middle School in Sugarland. The Sugar Land sessions will be conducted by Kenneth Fletcher. Again this summer, we are offering 3 Full Sessions of the SUMMER SCIENCE SAFARI in THE WOODLANDS AREA based at McCullough Junior High School in The Woodlands. The Woodlands sessions will be conducted by the Camp Director, Joe Watson. HANNAH WEINHEIMER will again be the Campus Coordinator at Cinco Ranch Junior High School, this summer. This year is Hannah’s second year teaching in public education. However, she has lots of experience in education in the College Station/Bryan area where she attended college. Hannah holds a Bachelor of Science Degree from Texas A&M University. She is originally from a small town south of Houston known as El Campo, Texas. Hannah currently teaches 6th grade science at Cinco Ranch Junior High. This will be her second summer as Campus Coodindator for the Summer Safari at Cinco Ranch. NICOLE KRAM will again be the Campus Coordinator at Tays Junior High School, this summer. Nicole currently teaches 6th grade science and is the Student Council Sponsor. This will be her second summer as the Campus Coordinator for the Summer Safari at Tays. Carlton Colmenares will, again, be the Campus Coodinator for our new high school program at Seven Lakes High School called the Summer Science Safari-High School Experience. Carlton has 13 years teaching science education. His experiences in cosmopolitan settings and agri-business equate to interdisciplinary success. As a boy, he was either wading in roadside ditches looking for tadpoles or up a tree to enjoy the view. He still finds fascination in the natural world and strives to impart this appreciation to his students. ﻿ This will be Carlton's second summer as Campus Coordinator for Seven Lakes High School in Katy. Students DO NOT have to attend these schools in order to attend the Summer Science Safari. In fact, our students have come from all over the country--and even outside the country! Last year, we even had a large group from Brazil. Our camp was even featured on Humble ISD District TV with Dr. Sconzo, the former Superientent of Schools, Humble ISD. To check out what we have in store for this year, please click the 2019 Activities and Registration Tab above and be sure to check out the video on last year's activities at the top of this page! The Summer Science Safari is a Monday through Friday day-camp except for the Wednesday through Thursday, 2-day, overnight trip to the San Antonio area. Because of the nature of our camp, we do not have exact drop off and pick up times until a few weeks before the camp starts. As a rule, you can consider most days will be from about 7:30 am to 7:00 pm. Since our sessions are small and they fill up fast. However, most Sessions still have spots availiable so sign up, today! Students DO NOT have to live in these areas to attend! Remember, Each Session Runs for the 5 Day Week with one Overnight trip on Wednesday to Thursday! * Red Indicates 3 or Less Spaces Available! * Orange Indicates Session is Filled but Taking Standbys! Some Kingwood/Humble Parents may find the New Caney/Porter Camp to be an Option. Some New Caney/Porter parents may find Kingwood/Humble to be an option. All grade-eligible Students (based on the 2018-19 school year) are able to attend camp at any of these locations. Attendance at these schools is NOT a requirement. Remember, you may find a camp that better fits your schedule at a nearby school. Since, we are a field- trip based camp, we do not use the facilities of these schools.